While the comparisons to Chaplin are obvious, Max Linder’s world does not seem as much of his own making as does Chaplin’s. The Tramp exerts control, with acrobatics, imagination, and the sheer assertion of self--while Max, like Keaton, is often surprised by the state of things, and puzzles his way along. He does, though, try his best. In Be My Wife, in his effort to triumph he dons various disguises--scarecrow, bearded music teacher, burglar. But the dog knows better, and tosses off or tears at each disguise. It seems that Max’s only hope is not to be himself, but to act. This is his victory. Sometimes. The wonderful opening gag in Seven Years of Bad Luck follows the breaking of a full-length mirror. The amorous butler backs the maid into it--then enlists the mustachioed cook’s help in hiding the damage until the mirror can be replaced. The cook dresses like Max, stands in the open frame, and mimics his master. The camera cuts to the giggling butler and maid, but we need no prompting: It’s a perfect scene. However, even when Max discovers the truth, he fails: Between the moment of discovery and his decision to bean the cook with a shoe, the mirror is replaced, and Max shatters it on his cook’s reflection. Linder’s long, befuddled take as he ponders the inexplicable serves well to sum up his place in the world: almost prepared, all but aware--and yes, in the end triumphant--but that comic necessity seems perfunctory, occurring despite Max as much as because of him. 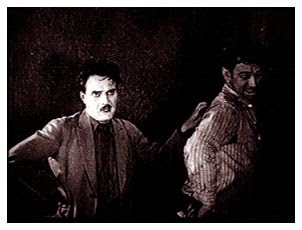 While Chaplin bats at every opportunity like a desperate pugilist, eventually throttling Fate into submission, the humor in a Linder comedy comes from watching a man deal with the (imagined) consequences of a shattered mirror in which he could have sworn he saw himself.